I LOOOOOVE this Writing Claw!!! It's made it so much easier for Elizabeth to hold her pencil. Her fingers simply fit into the little cups and away she goes!!! She would hold it so improperly before that I knew it would lead to handwriting issues later on. I was happy to find this Writing CLAW at our local teacher supply store. I didn't know this existed. I wonder if it's too late for me to use one. I have always held my pencil funny, and I certainly don't have the best handwriting. Have you used it yourself for curosity? I did try it!! I was worried I would stretch out the little cups, so I didn't try it for long, though. I'm sure you could use one, though!! I will have to look for one of these. Thanks for sharing! That's a new one for me! Very neat! 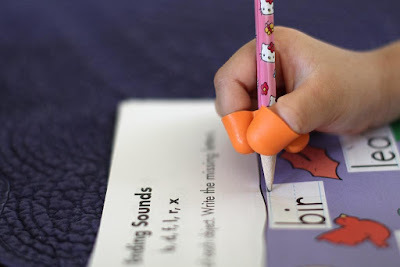 the writing C.L.A.W is very useful for special needs children.